We Should Invest in Education. Now! Everyone can agree that giving all children the opportunity to go to school is the right thing to do. Global efforts to do just this have achieved great success: almost two decades ago world leaders decided to invest in education so that every child, regardless of gender, place of birth or family wealth could have access to school. The results were amazing (if unsurprising): enrollment surged as more children than ever before began to attend school and the number of primary-aged out-of-school children dropped from 100 million in 2000 to 62 million in just eight years. The clickable map below shows where the out-of-school children live. Gender equality in education improved as well; the number of girls out-of-school fell from 58 million to 32 million in the same period – though they remain more than half of the total. However, progress on both fronts has tapered off, and the number of out-of-school children, along with the proportion of out-of-school girls, has remained largely unchanged since 2008. The bottom line is that more funding is needed to re-create the momentum and build on past successes. 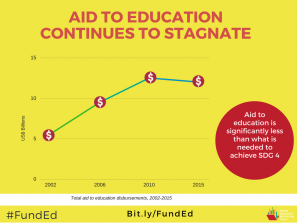 But global aid to education is lagging. Aid actually fell between 2010 and 2012 and, despite recent increases, is still below the 2010 peak. 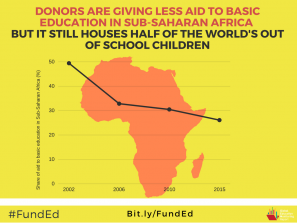 Just as disconcerting is the fact that education aid to Africa (home to the majority of out-of-school children) has, overall, received a declining share of total contributions. This has occurred despite the fact that education is one of the best investments we can make to end poverty, improve health and give people dignity. The long-term payoff that comes from investing in education can take years, and outcomes can be more difficult to quantify, than, say, health interventions which lead to a more immediate reduction in the number of cases of a particular disease. And, perhaps this dissuades politicians, who operate on a four-year cycle, from making the hard choices – when they may not be there to reap the rewards. For the children and their families, though, the payoff, when it comes, is worth every penny. Education has been proven to be one of the main drivers in reducing global poverty, improving health outcomes, and empowering women. It can also lead to more peaceful societies. Education lowers poverty. An individual can earn around 10% more for each additional year of secondary school education. This powerful income-generating potential can lift families out of poverty. The impact of education for women is even greater with an approximately 20% jump in earning potential for each additional year of schooling. Education leads to better health. An educated mother is much more likely to have her children vaccinated and to ensure her family sleeps under mosquito nets. This leads to better health outcomes and can reduce child mortality. Plus, out-of-school girls are three times more likely to be infected with HIV than girls who remain in school. A more educated society can promote greater peace and security. The probability of civil war can be cut by almost two-thirds when secondary school enrollment rises from 30% to 81% and if it is distributed equally across the population. Education improves gender equality. When educated, a woman’s higher earning power can elevate her standing within her family and community, which can give her more of a say in important decisions. It can also lead to lower levels of child marriage – a tradition which is often the result of poverty but which also exacerbates it by limiting women’s and girls’ potential and exposing them to abuse. Current development objectives, called the Sustainable Development Goals, expand on earlier successes. The goal for education (SDG4) aims for free schooling for all children and adolescents through to upper secondary school. Primary education alone is just not enough. Despite the massive and obvious benefits of investing in education, insufficient funding means that large numbers of young people remain without an education or the prospect of getting one. 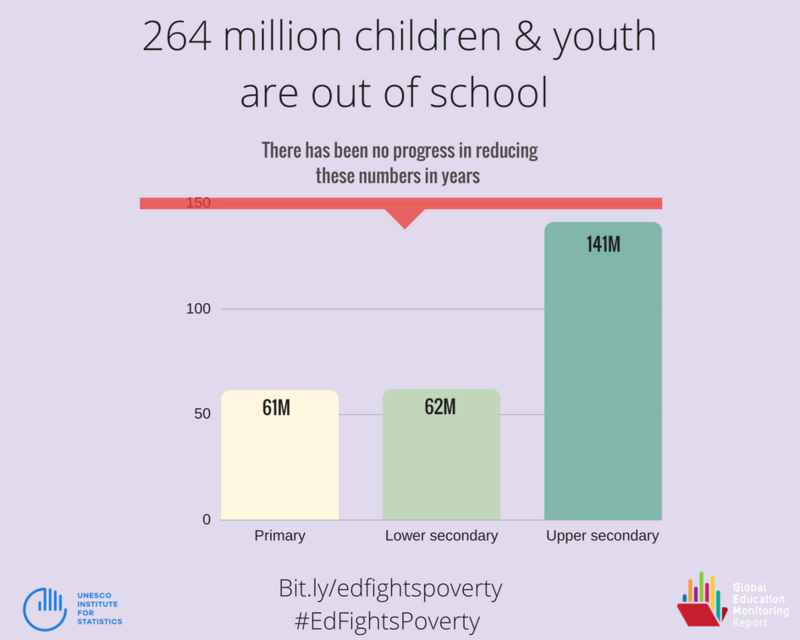 Putting together primary and secondary-aged children and youth, the total number out of school comes to 264 million. That’s 264 million individuals who will never have the opportunity to explore their own potential. Just as worrying, even some children who are in school are just not getting the basic skills they need as large class sizes, and a paucity of trained teachers, have limited the quality of classroom learning. A recent study by the UNESCO Institute of Statistics found that 617 million children (three quarters of whom are in school) did not meet minimum proficiency standards in literacy and math. The case for investing more in education has never been stronger. On 1-2 February, global leaders have a chance to address this shortfall when they meet in Dakar, Senegal, to replenish the Global Partnership for Education (GPE), a fund whose core mission is to provide grants to low and lower-middle income countries and which accounts for 12% of total funding for education in these countries. The Education Commission estimates that the GPE will need US$2 billion annually by 2020, rising to US$4 billion a year by 2030 to ensure that countries can invest in solid, evidence-based, national educational plans. Recipient countries must also pay up and are incentivized the do so under the GPE funding structure. In fact, to qualify for a GPE grant, a recipient must agree to a target of 20% of total budgetary spending on education. Additional funds are released based on agreed upon performance indicators such as learning outcomes and equity in education. Investing in global education benefits everyone as it supports greater global economic growth and promotes peace worldwide. We know, without a doubt, that a quality education is one of the most important investments we can make to achieve long-term, sustainable development. Education is crucial if individuals, communities and nations are to prosper. Let’s hope that world leaders can agree to this important funding initiative to give the world’s children the education that they need to get ahead – and that the world needs to achieve peace and hope for the future.